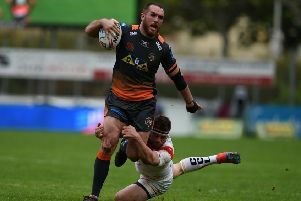 They were made to work hard for it in the end, but Castleford Tigers made it three wins on the bounce in the Betfred Super League as they beat Salford Red Devils 22-8 at the Mend-A-Hose Jungle. After opening up a 20-point lead in the first half-hour Daryl Powell’s men lost their way a little, but will be pleased to put another two points on the board. They certainly looked sharp at the start and were good value for their big lead, but failed to kick on after the break when only managing a penalty goal while Salford scored two tries. Cas forced some early pressure with Salford mistakes allowing them repeat sets near the visitors’ line. The Red Devils defence cracked on five minutes when Michael Shenton took Luke Gale’s pass in his stride and forced his way over the line despite the attentions of two Salford defenders. Gale’s goal from the touchline ensured the hosts had made the start they were looking for. A second try followed eight minutes later as a great set that started with a Ben Roberts quick 20-metre tap and a break by Shenton ended with Paul McShane’s grubber being fumbled backwards over his own line by Jake Bibby. There to pounce on the loose ball was James Clare on his first senior start in his second spell with the Tigers and Gale’s excellent conversion made it 12-0. Cas went down to 12 men for 10 minutes when Oliver Holmes was deemed to have made a spear tackle on Tyrone McCarthy and was sin-binned. But they increased their lead by two points with Gale kicking a penalty. When Holmes was back on the pitch the Tigers looked to score again with Greg Minikin inches short on the right wing after a great last-gasp tackle by Greg Johnson. Salford’s relief was temporary, however, as Gale followed up his own grubber and dropped on the loose ball after Josh Jones had fumbled over his own line. Gale’s conversion made it 20-0 and that was how it stayed to half-time. Salford did close twice just before half-time, but Lama Tasi was stopped just short and good defence by Jamie Ellis and Mike McMeeken kept out Junior Sau. The second half never got going as an exciting spectacle as the visitors improved their error rate and had more possession without being able to really hurt the hosts. Salford put their first points on the board on 50 minutes with Junior Sau racing through a gap for a try that Robert Lui could not improve. The Tigers then regained control as a Gale grubber forced a drop-out and McMeeken was tackled just short on a sixth tackle run play. Both sides then went down a man after Logan Tomkins would not get out of Grant Millington’s way after a tackle was completed and the Cas man shrugged him off, dumping him to the ground. The result was a penalty that Gale goaled, but the two players involved were yellow carded. Adam Milner, who had a strong second half, forced a drop-out with a terrific angle kick, but the pressure came to nothing with Cas the team now making mistakes by trying to force passes too often. Salford came on strong in the last 10 minutes as they had three players held up over the line on a set helped by three penalties to them. Jackson Littlejohn, Tasi and Weller Hauraki were all denied by good goal-line defence. Gale sent a drop-goal attempt wide for Cas and a great break by McShane was wasted when Holmes’ offload was snapped up by Salford. The visitors managed a late consolation with probably the best try of the day as Niall Evalds’ brilliant flick pass allowed winger Bibby to dive over. But there was no conversion and no time for them to make any further inroads into the Tigers’ lead. Scorers: Castleford: Tries Shenton, Clare, Gale; goals Gale 5. Salford: Tries Sau, Bibby. Castleford Tigers: Roberts; Minikin, Webster, Shenton, Clare; Ellis, Gale; Massey, McShane, Millington, Holmes, McMeeken, Foster. Subs: Milner, Cook, Sene-Lefao, Green. Salford Red Devils: Evalds; Bibby, Welham, Sau, Johnson; Lui, Littlejohn; Griffin, Wood, Burgess, Jones, Hauraki, McCarthy. Subs: Tomkins, Tasi, Nakubuwai, Flanagan.